A few weeks ago, winter came early. At the weekend we had written a list of all the things that need to be done before winter arrives, it seemed like a long list, and we got to work on it first thing Saturday, and ticked off several things. Then on Monday the rain started in the middle of the night, and it rained and it poured, and the wind beat that pouring rain against the back of the house, and the sun never made an appearance and it was cold. There was a mountain of washing and nowhere to dry it, there was a mountain of dishes and I had to clean them to have breakfast... there was no firewood cut for the fire, the chicken house was at the other end of the garden.... And there was plastering and woodwork needing done and I was cold and the house was dirty and I had a child to amuse. So we wrote a new list which prioritised not stopping the weather coming in, but making normal life possible when the weather gets worse, and stopping me from loosing the plot altogether. Note how easy the things on the second list are, but I was focusing on the first list. The first list is important, but the second list is what makes it possible to then complete the first list. I know how good it is when I stick to routines, and how smoothly the things were running that were part of those routines... the bed is always made, the ironing and shopping always done, the meals are always planned. Now every morning, within 15 minutes of getting up, all the housework is pretty much taken care of, with a few other routines falling in place after dinner and just before bed. It all happens so quickly and effortlessly now that I don't even need to think about it. The rest of my days can be full to the rafters (literally) with plumbing, plastering, painting, woodwork and home-edding without spending more time worrying about the mountain of washing or dishes, or cringing at the paint in the bathroom sink or the mess on the kitchen floor. Flylady sends out a daily motivational email which has stories from other people following the system and some essays from the original flylady. They also send out a mission of the day, often it is a de-cluttering mission for 15 mins, or it is doing some seemingly hideous cleaning chore, which usually only takes a minute or 2. We have cleared out a lot of clutter, we had lots of stuff that gave us nothing but guilt. 'Sunday night stress' is improving each week. We both feel more on top of our finances, house, belongings. The stress levels in the house are lower than they have been in years. So I am an official convert, one of those annoying people who keeps saying "Flylady says you should...."
I didn't expect to get any results more than the washing being done and the bed being made but it has somehow got a lot more out of it. I guess we just thrive in more ordered, tidier surroundings... or maybe it is the way it is the little challenges... or maybe routine is good for all of us. 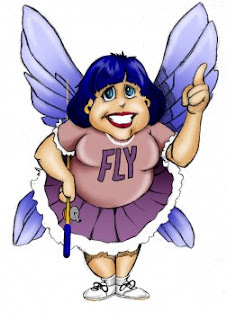 The flylady system works for tens of thousands of people around the world.... give it a try, it might just work for you. I'm away to read flylady as things are getting a wee bit out of hand over here. I'm a flybaby from Quebec, Canada. I'm working on creating a forum for flybabies from all over the world. Would you please like to come and help me make this place home?